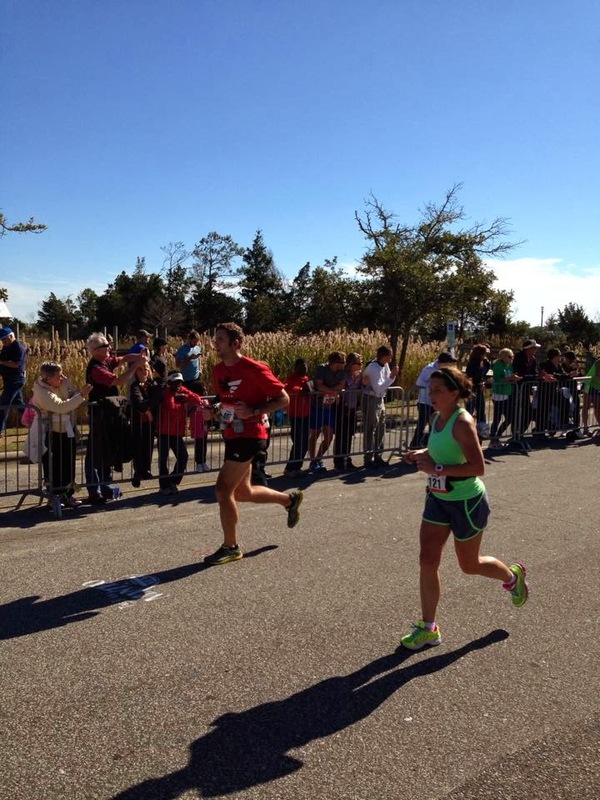 The day has finally come for the Outer Banks Marathon. An event that we have been training for what seems like an eternity. Its hard to believe that its over… well at least this one. There were friends of ours running several of the races this weekend. A few of them ran multiple races. But what’s a 8K one day followed by a Half Marathon the next? My hats off to them! 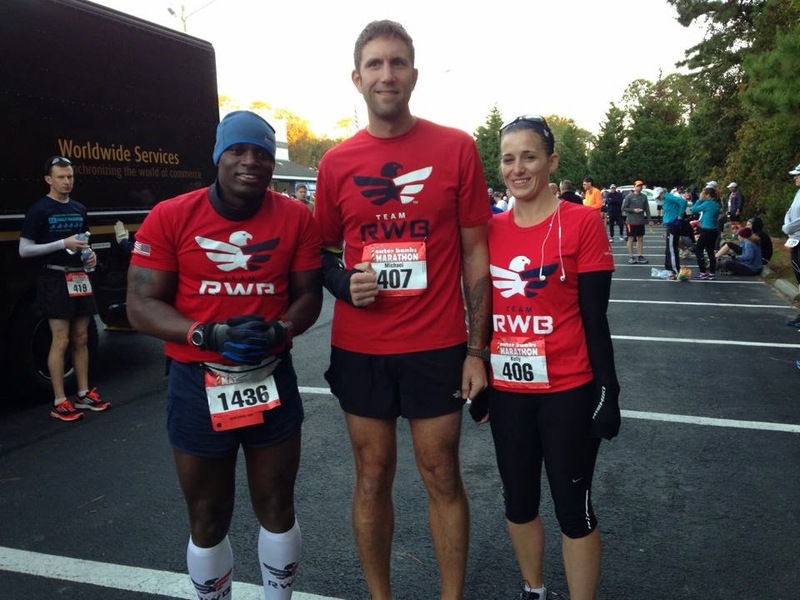 Fayetteville Running Club and the Fort Bragg Chapter of Team RWB were in full force. 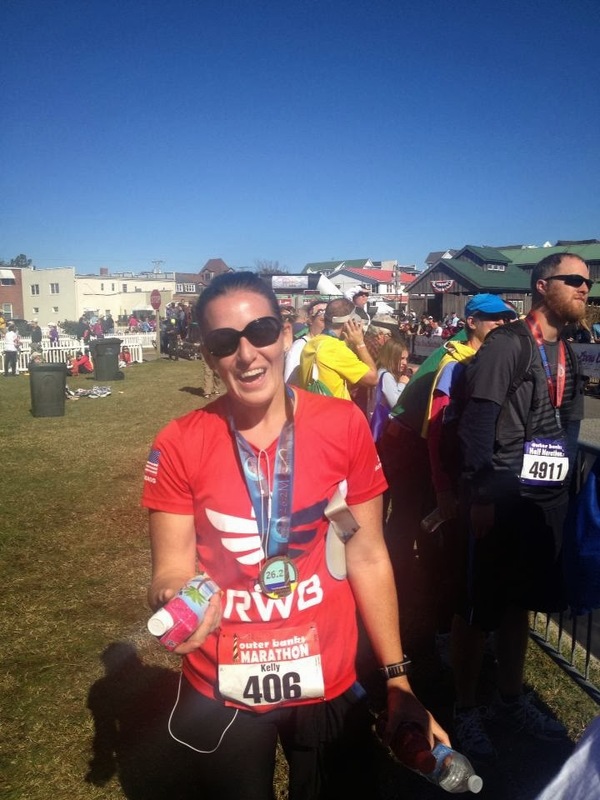 We did run into another Team RWB runner from the DC Chapter. The morning air was a bit chilly but at only 48 degrees is seemed worse than it was. Maybe it was the cool breeze coming off the ocean. Either way the skies were clear and we were ready to run. 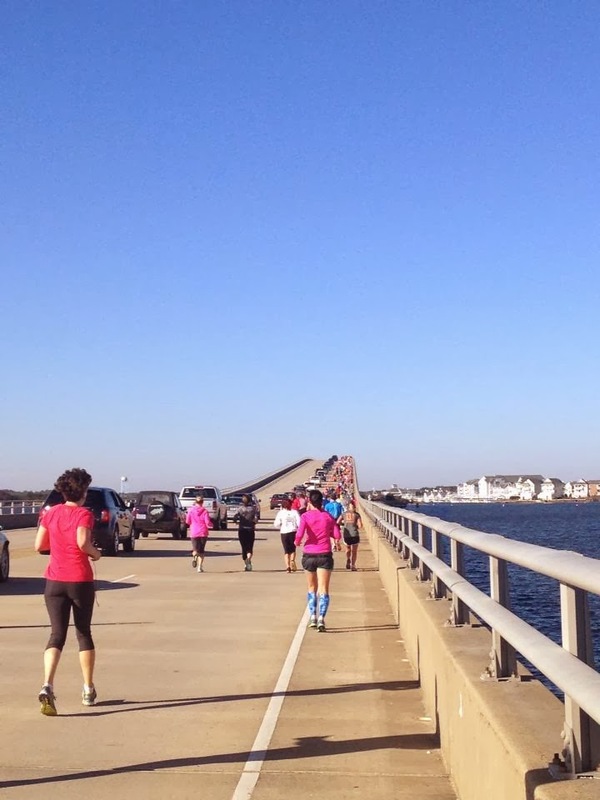 The course started off in Kitty Hawk, NC heading south along the Inter-Coastal Waterway side of the Outer Banks. The locals were out in full force cheering us on as we ran through their neighborhoods. 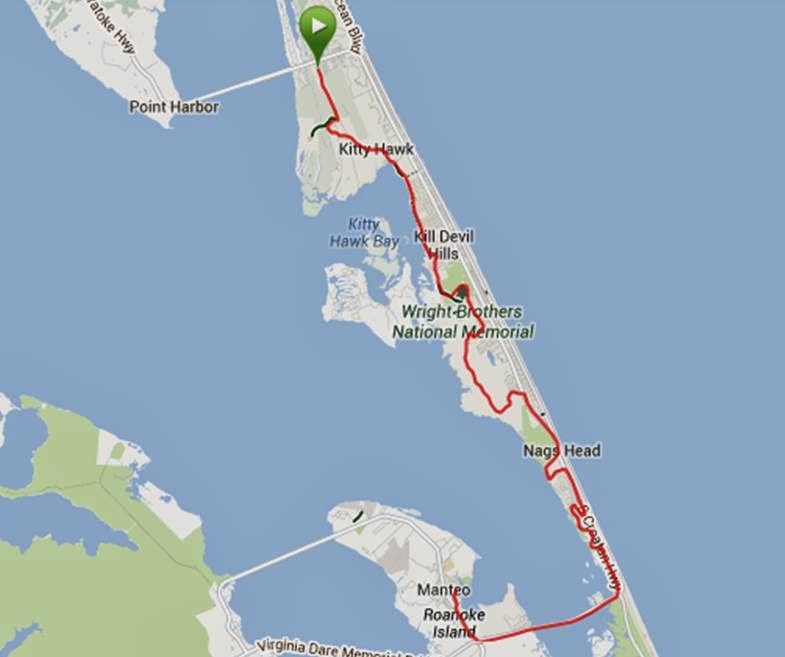 From there we ran down to Kill Devil Hills, NC and around the Wright Brothers Memorial. So after that the adventure began. We found ourselves running on a dirt trail through the woods for about the next 3 miles or so. It felt like an eternity. I’m not sure if it was the hills and dirt or that I just wasn’t expecting it. Either way we made it and found ourselves back on pavement. The rest of the course was a mix of residential and open road. Other than the miles and the wind the next challenge would be the “Bridge”. To make matters worse the bridge is strategically located at mile 22 of the course. If I hadn’t been so tired from the previous miles it really wouldn’t be that big of a deal. Between the hills several of the races in Fayetteville and the hills in our Wednesday night run I would like to think I don’t do to bad on hills. I feel no shame is saying I walked a step or two on that bridge. Once the decent from the bridge was done it was only a few short miles to the finish. Kelly made it to the finish at a smoking 4:01:47!!! I’m glad we had some friends there to capture forever the look on her face. I know I am proud of her. I came in about 21 minutes later at 4:22:10. My only small complaint is that according to Garmin the course was a quarter mile long. It’s hard to believe that its actually over. We have spent the good part of the last four months training and preparing for this day. Our first Marathon is in the bag. Guess it’s time to start planning the next adventure. Maybe a Ultra Marathon?!?! After all it’s all about the miles!!!!! ← We have arrived in OBX!